On possibly the wettest and wildest day this year, Team Activ had the pleasure of designing a bespoke challenge for the Institute of Groundsmanship (IOG). With colleagues travelling from all over the country to take part, the afternoon was set to be an exciting, collaborative and highly competitive event. Throughout the morning the IOG team worked together on strategy and plans for the future. Team Activ arranged the afternoon session, designing activities to enhance team work, communication, creative thinking and continuous improvement. 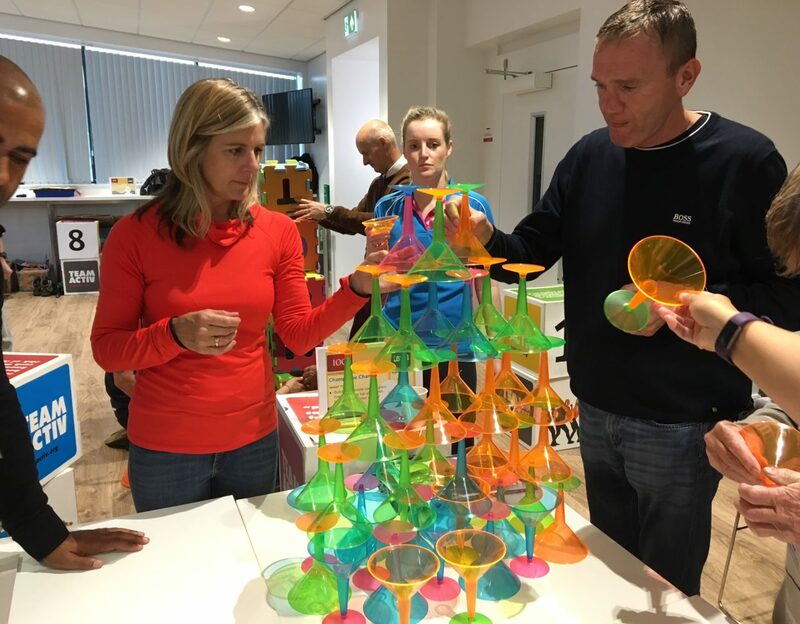 The event began with each team creating a sculpture to represent their values and presenting it to their colleagues; there were some absolutely ingenious creations and hilarious descriptions. We followed this with a fast paced (and very soggy!) treasure hunt anagram challenge where small teams had to find as many clues as possible in the time limit to solve the word puzzle. Other activities included the fabulous ‘Champagne Charlie’ cocktail glass stacking gamble and ‘Splash Daze’ mental and physical problem solving task. It was an extremely memorable afternoon, with a palpable buzz in the room. The IOG team showed excellent creativity, resilience and wonderful team relationships and Team Activ look forward to working with you again soon. IOG is the leading membership organisation helping you create quality sport surfaces, through excellence in grounds maintenance and management. Team Activ help businesses create and develop high performing teams.